From Peter the Great to Putin, this is the unforgettable story of St Petersburg – one of the most magical, menacing and influential cities in the world. St Petersburg has always felt like an impossible metropolis, risen from the freezing mists and flooded marshland of the River Neva on the western edge of Russia. It was a new capital in an old country. Established in 1703 by the sheer will of its charismatic founder, the homicidal megalomaniac Peter-the-Great, its dazzling yet unhinged reputation was quickly fashioned by the sadistic dominion of its early rulers. This city, in its successive incarnations – St Petersburg; Petrograd; Leningrad and, once again, St Petersburg – has always been a place of perpetual contradiction. It was a window on to Europe and the Enlightenment, but so much of the glory of Russia was created here: its literature, music, dance and, for a time, its political vision. It gave birth to the artistic genius of Pushkin and Dostoyevsky, Tchaikovsky and Shostakovich, Pavlova and Nureyev. Yet, for all its glittering palaces, fairytale balls and enchanting gardens, the blood of thousands has been spilt on its snow-filled streets. It has been a hotbed of war and revolution, a place of siege and starvation, and the crucible for Lenin and Stalin’s power-hungry brutality. 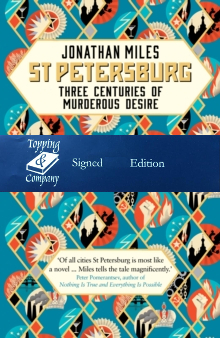 In St Petersburg, Jonathan Miles recreates the drama of three hundred years in this absurd and brilliant city, bringing us up to the present day, when – once more – its fate hangs in the balance. This is an epic tale of murder, massacre and madness played out against squalor and splendour. It is an unforgettable portrait of a city and its people.